Denise McQuown-Hatter, President and CEO of Affinity Health Services, will be presenting with James Aurand, NHA, Administrator at Susque-View Home Nursing & Rehabilitation/Premier Healthcare Resources, Inc. and Erica Mulberger, Executive Director at Central Pennsylvania Workforce Development Corporation (CPWDC) at the Pennsylvania Coalition of Affiliated Healthcare & Living Communities (PACAH) Spring Conference, to be held at the Penn Stater Hotel and Conference Center from April 23rd to April 26th. and will continue to be the number ONE (#1) challenge we face. PACAH was formed in 1951 to represent county nursing facilities. Now, PACAH represents over 143 diverse long-term living and supports providers and associated businesses, including both county, veterans, private, and non-profit nursing facilities. The date is quickly approaching for Affinity Days 2019. This annual training and development conference features various speakers who aim to provide motivation and inspiration to Affinity communities who continue in their goal of delivering excellent services. This year’s keynote speaker, Clint Maun, CSP, will aim to help in this inspiration. 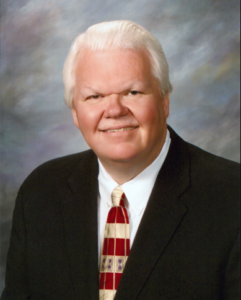 Clint is nationally recognized for his innovative expertise in healthcare consulting, speaking and research. Clint is a co-founder of Maun-Lemke Speaker and Consulting LCC and his entire career experience has been in healthcare operations, management, leadership, quality enhancement and self-development programs. Clint has the proven ability to motivate individuals to positive action and implement results-oriented change and his dedication to our profession is evident as he brings advocacy for positive self-esteem and motivation to a new level. See Clint’s full bio here, or you can listen to his free daily audio podcast at www.clintcast.com. Among other training presentations featuring Affinity staff members, we are excited to welcome Clint and look forward to learning from his experiences. We are pleased to welcome Cheryl Metrick, RN, NHA, WCC, LNC, Clinical Consultant to the Affinity team. Cheryl brings 30 years of experience in senior community management to Affinity Health Services, Inc. Cheryl was a Director of Nursing and Nursing Home Administrator for a large non-profit continuing care retirement community early in her career. After achieving many successes in facility based management, Cheryl joined a large nationwide for profit provider as a Clinical Services Consultant. As a Clinical Services Consultant, Cheryl had oversite of multiple post-acute living centers in various states including PA, OH, WV, TN and CA. After seven years as a Clinical Consultant, Cheryl was asked to serve as the Area Vice President for the same organization in which she had operational oversight of financial, clinical, budget development, compliance, HR and environment of care. Most recently Cheryl had briefly relocated and had the experience of serving as an interim Director of Nursing and subsequently training her replacement. In addition to Cheryl’s credentials, she achieved her Certification as a Legal Nurse Consultant from the American Association of Legal Nurse Consultants. Tammy Coleman, Angela Huffman and Dana Heitzenrater, three Clinical Consultants at Affinity Health Services, have obtained their Certificates of Training in Infection Prevention in Long-Term Care. As managers and consultants, our team can best serve our clients by staying current in facility level requirements. The APIC certificate program requires education on topics such as Microbiology 101 for Infection Preventionists, State and federal regulations for infections prevention and control, Environmental services’ roles in infection prevention, and additional topics. Denise McQuown-Hatter, President and CEO of Affinity Health Services, will be presenting at this year’s County Commissioner Association of Pennsylvania (CCAP) Conference and Trade Show, to be held at the Wyndham Gettysburg and Gateway Campus of Adams County from August 5th- 8th. Long-term Care in Pennsylvania has changed significantly over the past few years impacting our county nursing facilities. The implementation of long-term care managed care (Community HealthChoices); increased scrutiny by the Department of Health and CMS; work force issues; stagnant reimbursement rates; the movement towards value based care; the implementation of Medicare network standards; new survey guidelines; and many other changes have impacted the way skilled nursing facilities are doing business. This session will explore these changes and other factors impacting county nursing facilities, and offer suggestions and real life examples of how nursing facilities and their staff can continue to run a successful nursing facility, with panelists including nursing facility management companies and a county nursing facility administrator. Denise McQuown-Hatter, President and CEO of Affinity Health Services, and Sheila Capitosti, Vice President of Compliance Services with Functional Pathways, will be presenting at the 2018 LeadingAge PA “Focus on the Future” Annual Conference, held at the Hershey Lodge from June 20th to June 22nd. Skilled nursing facilities have experienced the effects of numerous alternative payment models in the past couple of years including but not limited to ACOs, Bundle Initiatives and Medicare Advantage organizations all of which have led to an emphasis on preferred providers and narrowing of networks to include those who can demonstrate the best financial and clinical outcomes for Medicare beneficiaries. But the fog of uncertainty is not over by any means. CMS has issued an Advanced Notice of Proposed Rule-Making announcing that it plans to propose payment reform effective October 2018 (FY 2019). The proposed payment reform model, known as Resident Classification System Version 1 (RCS-1) eliminates therapy minutes as a driver of reimbursement rates and has the support of MedPAC and the OIG. The Improving Medicare Post-Acute Care Transformation (IMPACT) Act of 2014, required MedPAC to develop a unified pay system spanning the four post-acute care settings, and MedPAC’s June 2017 report recommended that Congress direct Health and Human Services (HHS) to implement a system for post-acute care beginning in 2021 with a three-year transition. In their December public meeting, MedPAC recommended that Congress should direct HHS to begin to base Medicare payment to post-acute care providers on a blend of the setting specific relative weights and unified post-acute care prospective payment system relative weights in fiscal year (FY) 2019. MedPAC staff suggested that a blended system could be used in 2019 and 2020 until a transition to a unified post-acute care pay system begins in 2021. Regardless of what the reformed payment model will look like, it is clear that reform is indeed not an uncertainty. The opportunity lies in identification of common threads among all the payment models and preparation for success in a new era of care delivery and reimbursement. Learn more about LeadingAge PA’s 2018 Annual Conference. Following National Nurses Week, the American Health Care Association (AHCA) founded National Skilled Nursing Care Week (NSNCW) as a time to recognize skilled nursing care centers across the country, who provide dedicated services and care for seniors and individuals with disabilities. As you celebrate National Skilled Nursing Care Week, take some time to Celebrate Life’s Stories with your loved ones. For National Skilled Nursing Care Week resources- including a press release toolkit, logo graphics, and more- visit the official American Healthcare Association website. National Nurses Week, May 6th to May 13th, is recognized by the American Nurses Association as a time to honor nurses across the country and celebrate their valuable role in healthcare, while educating the public on the profession. Gallup polls show that “the public has rated nursing as the most honest and ethical profession for the past 16 years” (American Nurses Association). This year’s theme is Nurses: Inspire, Innovate, Influence. From the Affinity Health Services team, we thank all of the nurses we have the pleasure of working with each and every day. We salute our team of clinical nurse consultants Angela Huffman, Dana Heitzenrater, and Tammy Lucas-Coleman for their dedication and leadership in their profession. There are a number of organizations and restaurants that offer special discounts during National Nurses Week. 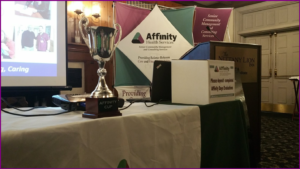 Affinity Health Services and its affiliate communities aimed to take strong leap into 2018 with the annual Affinity Days Conference last month in State College at the Penn State Nittany Lion Inn. This two-day retreat involved a full agenda designed to be beneficial for each community represented at Affinity Days. 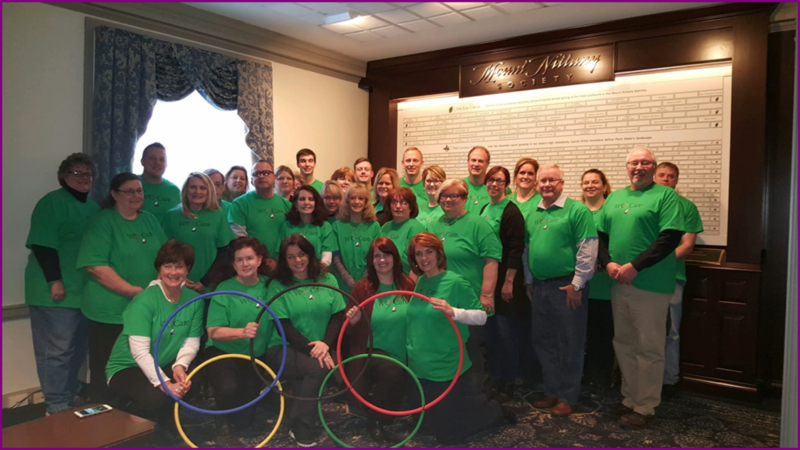 The retreat had a motivating Olympics theme as it overlapped the final days of the 2018 Winter Olympics. 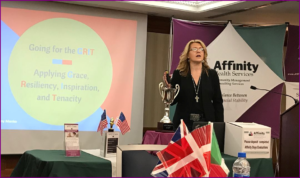 After a meet and greet Affinity Days was kicked off with a presentation from Dr. Tammy Manko on “Going the GRIT” and resilience. This inspiring presentation focused on maintaining a healthy and positive attitude each day and to be leaders in tackling and overcoming challenges. Following department focused roundtable discussions, Affinity Director of Human Resources, Mary Kate Bartley, presented a collaborative recruitment and retention plan designed to be an effective tool for each organization. Attendees then participated in an HR Boot Camp presented by Burns White Law Firm. Day two of the Affinity Days conference is designed to recognize the achievements and successes of affiliate communities. Awards are presented to communities based on annual metrics quantified prior to the event. In addition to another round table session, Affinity’s Director of Marketing and Business Development, Kimberly Kelly-Clutter, educated and refreshed employees on the “WE CARE” policy implemented throughout all affiliate communities designed to welcome communication and empathy for all employees, residents, families and other stakeholders. Affinity Days aims to be a time for all leaders and community representatives to convene, support, and learn from one another in best practices as well as recognize all achievements and successes. By providing attendees a chance to grow together, the goal is ultimately to lead to the possible care for residents and families of each community.